Brian (BK) McLaughlin is Director of Business Development for south Texas. 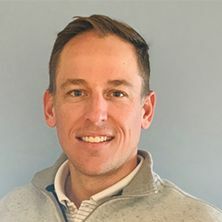 BK most recently worked as a territory manager for MWI Animal Health before joining SVP in 2019. Before MWI, BK was a regional sales manager for Nutramax Laboratories and sales manager at Securos Surgical. BK graduated from Central Connecticut State University with a degree in Marketing while playing baseball for the university. Outside of work, BK enjoys hunting and fishing. BK lives in Texas with his wife Molly and son, Davis.